In 1904, there was a movement by the Dutch city of Leiden to check all street names and make sure there were no doubles present. Sure enough, 14 duplicate street names were found and one of each pair needed to be renamed. 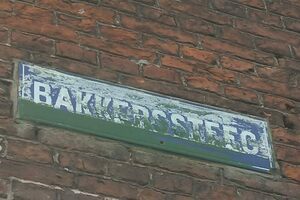 One of the streets called «Bakkerssteeg» was changed to «Pelikaanstraat,» while the other «Bakkerssteeg» remained. All signs on the new Pelikaanstraat displaying the old street name were removed, except for one that was covered by a shop’s front logo and remained untouched for many years. It even survived the major development during the 1970s in which many buildings around this area were torn down to make room for a road around the city. Though few passersby even give it a moment’s pause, the surviving duplicate «Bakkerssteeg» sign is still exposed on the side of a building at 27 Pelikaanstraat. The century-old sign is quite worn and dirty, but those who are aware of its history do not want to clean the old sign for fear of it being noticed by the city and removed.